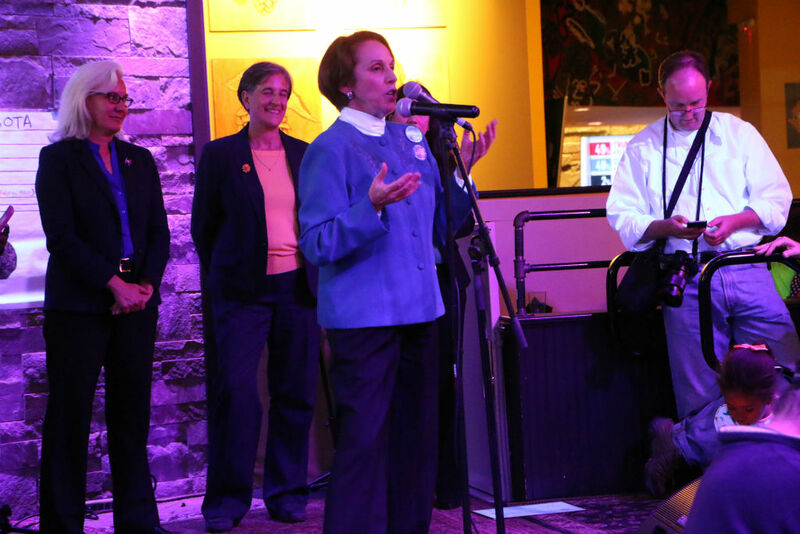 (Updated at 11:30 a.m.) Local candidates celebrated victories Tuesday night while shocked Democrats watched the presidential election slip out of their grasp. County Board Chair Libby Garvey will serve another term after defeating independent Audrey Clement. With all absentee ballots counted, Garvey and Clement have 71 and 27 percent of the vote, respectively. “I’d like to give a shout-out to my opponent, Audrey Clement,” said Garvey in a speech at the Democratic victory party at Sehkraft Brewing in Clarendon. It’s important for all voices to be heard in a democracy, Garvey said. Tannia Talento and Nancy Van Doren, who both ran unopposed, have won seats on the Arlington County School Board. Arlingtonians have overwhelmingly voted in favor of all four bond referenda. Metro and transportation has 78 percent approval, parks and recreation has 75 percent, community infrastructure has 75 percent and the Arlington Public Schools bond has 80 percent. Like Virginia voters statewide, Arlington County voters rejected a “right-to-work” state constitutional amendment while approving an amendment providing property tax relief to the spouses of fallen first responders. Arlington County voters chose Hillary Clinton over Donald Trump. In that race, Clinton has 76 percent, Trump has 17 percent, Gary Johnson has 3 percent, Jill Stein has 1 percent and Evan McMullin has 2 percent. Clinton’s net 71,724 vote victory over Trump in Arlington contributed significantly to her 182,954 vote margin over Trump statewide. An initially optimistic mood at the Democratic event at Sehkraft gave way to anxiety over the results of the presidential race. At 10:40 p.m., CNN called Virginia for Hillary Clinton, lightening the mood a bit. Early Wednesday morning, however, the race was called for Donald Trump, raising questions about how Arlington might fare under a Trump administration. In the 8th congressional district race, Arlington County voters gave a large margin of victory to incumbent Democrat Rep. Don Beyer, with 71 percent of the vote over Republican opponent Charles Hernick with 25 percent. That margin, however, was narrower than Clinton’s 76-17 margin over Trump in Arlington. Beyer won the district as a whole 68 percent to 27 percent for Hernick. County election officials did not receive reports of any major local voting issues. They say there were no lines at any of the county polling places within the last half hour of voting, indicating most residents who intended to vote already had. 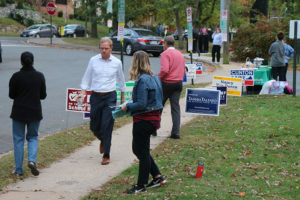 There were long lines at many polling places this morning, but they largely died down after 9 a.m.
Before the evening rush, Arlington County Registrar Linda Lindberg had said most precincts reported about 50 percent voter turnout, while another 25 percent or so voted absentee. Lindberg expects final numbers to be close to those from 2012, when Arlington experienced 83 percent voter turnout. About 118,000 ballots were cast at that time, which was a county record. ARLnow conducted a live video broadcast tonight from Sehkraft from 7:30-9:30 p.m., in which editor Scott Brodbeck spoke with elected officials including County Board Chair Libby Garvey, County Board Vice Chair Jay Fisette and Virginia state senator Adam Ebbin. The video from the broadcast is available above.